When it comes to food, I am a huge fan. :) I am especially a bread fan...bagels, rolls, muffins, pita pockets, you name it - I eat it! I know carbs are not that great for me, but sometimes that feeling for some "comfort food" over-rides my will to not eat so many carbs! I have a really nice, brand new product to introduce to you today and it is YUMMY! 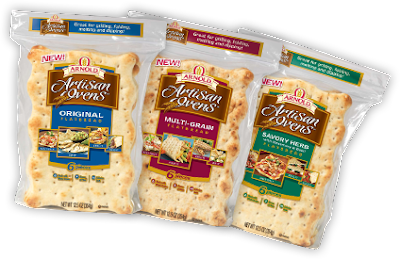 The Arnold Bread Company has always been a favorite of mine for whole grain breads...which is why I was excited to learn I was being given the opportunity to review their all new Artisan Ovens Flatbread! In March 1940, Dean and Betty Arnold baked the first two-dozen loaves of Arnold bread in a brick oven at the rear of a small house in Stamford, Connecticut. Placing their trust in superior ingredients, like unbleached spring wheat flour, honey, butter and eggs, they developed the golden rich bread that would soon become a leading premium brand with an international reputation. Mr. Arnold established a baking business of his own because of a serious allergy to flour. After graduating from Columbia University, he worked for a large baking company until his allergies grew too severe to continue. In January 1940, with only $600 in severance pay, he and his wife, Betty, moved in with his uncle on a farm in Armonk, New York, and began baking. Always believing there was a need for a better loaf of bread, Dean and Betty took their unique recipe and stoked up their first brick oven. Soon, the whole family was involved as relatives helped to slice, wrap and hand deliver the bread from house to house. By 1941, business was booming and the bakery needed to expand. Though he didn’t have a financial statement, Dean was granted a bank loan on the taste of his bread alone and moved the bakery to Port Chester, New York. The growth continued. While vacationing in Florida in the 1950s, Dean and Betty heard complaints from relocated New Yorkers that they were not able to get quality premium bread like Arnold. So in 1959, the Arnolds took over a 24,000 square foot plant in Riviera Beach, Florida, and brought their bread to the sunshine state. In the sixties, they built the largest bakery under one roof in the world, including the largest brick oven anywhere, in Greenwich, Connecticut. In 1971, Dean Arnold retired, but his famous recipes and techniques live on. Today, Arnold is a part of Bimbo Bakeries USA and the love of baking continues. Like I said, Arnold is my first choice when it comes to whole grain breads...I just feel like I am eating a better bread. For this review, I was sent a nice package of goodies. I was sent a reusable shopping bag, an Arnold Artisan Ovens oven mitt, two coupons for $.75 off any Artisan Ovens product, one bag of Original Artisan Ovens Flatbread and one bag of Savory Herb Artisan Ovens Flatbread. I was very excited to try out these breads...as they looked VERY yummy and smelled great - even though they were packaged well! What is really great about these flatbreads is that they are large enough to fold in half for sandwiches (without falling apart) or they can be cut into squares for dipping. For dinner the other night, I decided that I would make a pizza out of the Savory Herb Flatbread. This flavor is perfect as it has rosemary and basil...great spices to have with pizza! All I did was put the piece of flatbread on a cookie tray, covered the bread with pizza sauce, miniature pepperoni and mozzarella cheese. Then, I baked it at 425 degrees for 10 minutes. It turned out perfectly (for me...I like my pizza well done) and tasted amazing! Then, tonight I needed a snack so I tried the Original Flatbread. This time, I split it in half and toasted each half. When it was done, I spread a bit of butter on each slice. It was sooo good! I really am excited to try this bread along side my home-made hearty tomato soup! Mmmmm. These wonderful Flatbreads are currently only available in the Northeast at Walmart and Sam's Club. Arnold is working at making them available at more markets soon...I sure hope so as you don't want to miss out on this wonderful product!!! So, in my opinion...Arnold Artisan Ovens Flatbreads are delicious! I am really loving the Savory Herb and am looking forward to trying it in different ways. The Original Flatbread is great also...and I am excited to get creative in using it as well! I highly recommend this product to anyone, especially to those of you out there who LOVE breads and pitas! Disclaimer: I received no monetary compensation for this post. I did receive Arnold Artisan Ovens Flatbread products for review purposes. All quotes are from the Arnold Artisan Ovens website and email. All thoughts and opinions are mine.